Ana Pujols McKee’s passion for quality and safety existed long before she joined The Joint Commission as executive vice president and chief medical officer. 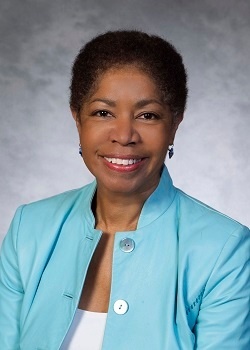 She previously served as the CMO and associate executive director of Penn Presbyterian Medical Center, in Philadelphia, and as a clinical associate professor of medicine at a teaching hospital in Philadelphia. Pujols McKee has championed for years the need for transparency and patient-centered care. “I’ve had my own personal experience with injury as a patient, and I think what began to propel me in this area were some of the unfortunate patient injuries I had to deal with as a chief medical officer. Seeing up close how deep the injury extends to the patient and family is truly overwhelming,” she says. The physicians and nurses who are involved in an incident when a patient is harmed suffer too, she is quick to add. Being able to make strides in that area, Pujols McKee says, has been one of the highlights of her career. From the time she was a child, she says, she knew she wanted to not only become a doctor but to run a large clinic – “all those altruistic dreams of taking care of people and making people well,” she says with a chuckle. Pujols McKee’s prospects on the surface looked daunting – the world in which she grew up had some prejudicial obstacles blocking her way. She remembers constantly visiting a high school counselor to obtain information on college admission, only to have the woman continually tell her that she was busy or had no guidance for her. Besides being a driven student, Pujols McKee says, her parents were a strong cheering section. In her Puerto Rican family, her father was an electrician and her mother was a teacher. Together, they taught her the importance of perseverance as she grew up in the South Bronx. She is hopeful that the changing face of The Joint Commission, which she joined in 2011, opens many doors for hospitals to achieve their full potential. To that end, The Joint Commission enterprise has expanded its offerings by adding a new affiliate to its portfolio, the Center for Transforming Healthcare, to help health care organizations improve patient safety through the use of Robust Process Improvement™ tools including Lean Six Sigma and change management. The commission also partnered with the American College of Physician Executives to begin an academy for chief medical officers. Pujols McKee’s own journey from clinician to C-suite executive has been typical of physician leaders, she says – one that included some growing pains. Such transitions, she says, need to thoughtfully include more diverse leaders to improve healthcare and to more accurately represent the diverse communities they serve.